The title is a homage to The Wizard of Oz's 70th Anniversary (which I think is today) Not really much to say today. Last night LOML and I picked up the other dresser (chest of drawers) and placed it in the only open spot in the bedroom. He now thinks we may need to rearrange the bedroom. That's an undertaking I'm not sure want to engage in. It's not that we have a lot of furniture or anything. I just can't fathom another way to set up the room that'll satisfy me as much. I do have to admit that I'm simply insanely happy that we now have a place for me to put all the clean laundry, instead of storing it in the laundry room until it was worn and dirty again. It's such a relief! Let me mention that on the way to get the chest of drawers, I was amazed to realize that my husband doesn't know me at all. He mentioned that we need to make a list of all the tasks we need to get done before we take vacation with the RV (like get the new tags, finish cleaning it, make some bank deposits, etc.) I looked at him like he was crazy and informed him that I've already made the list. If anything, I am a list-maker. I may not refer to the list, complete ANYTHING on it, or remember where I put it; but I sure as hell am going to make one. Come on!! What else? Ummm- I haven't reported on the content of my craft bag recently. 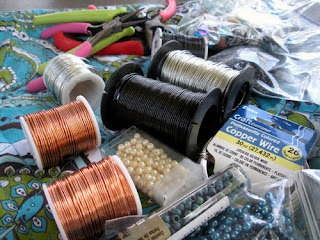 For those of you just joining us, I craft (hence the Crafty Hope blog name.) Since I'm always on the move and I never know when the crafty urge or some spare time is gonna hit, I carry some sort of bag with me most of the time that contains the supplies for at least one project. I've been carrying around the current craft bag/supplies for several weeks now without mentioning it yet. I even took some photos for your pleasure! Let's see. . .it's a beading bag. 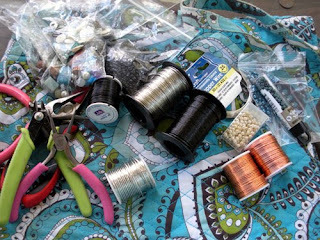 Basically, it's an old purse with several spools of wire, 4 pairs of pliers, and a bunch of beads. 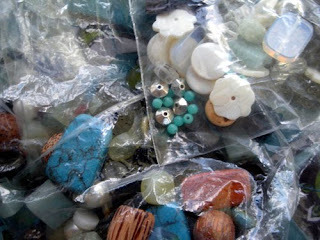 The beads are mostly loose in plastic bags. Sorry the picture's so bad, but I didn't have much time to snap the shot and couldn't risk them rolling away. If you haven't heard about the trend of deciphering music videos into their literal meanings, you should def check these out to get a better understanding of literal music videos. I'll close on a positive thought: We're halfway to the weekend now! !